Cool concept with artisan design. 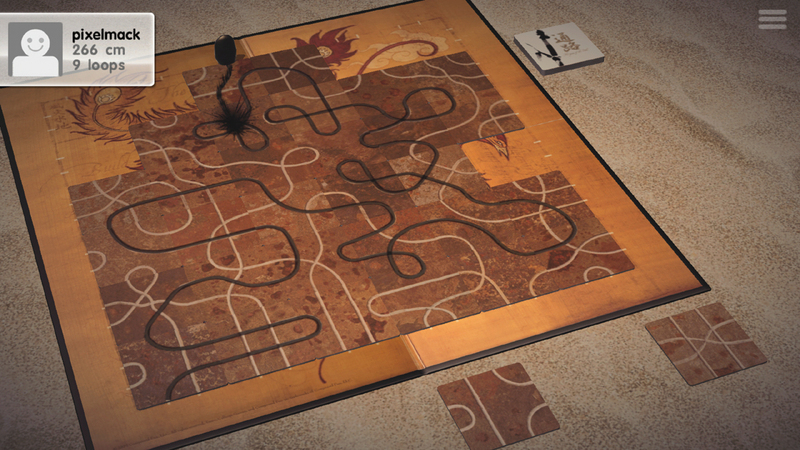 Can Tsuro carve a path into your phone or tablet? Tsuro; The Game of the Path is a tile placement strategy game wherein your piece must remain on the board, travel further, or make more loops than your opponent. 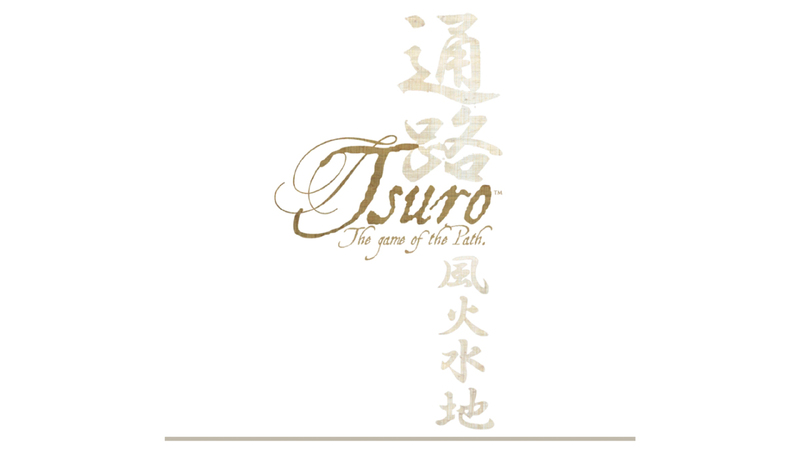 Fans of games like Tokaido, that focus on the artistry of the music and the game components should really enjoy Tsuro. It is a game of forethought and zen that we truly enjoy. 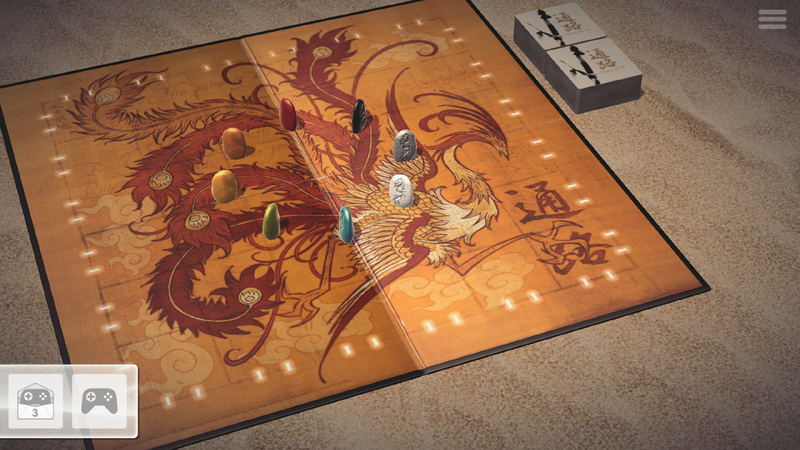 Our Tsuro App review is sure to have you downloading the game within minutes! Tsuro begins by placing your colored stone on any edge hash mark of the square board. There are 48 possible starting positions for you to choose from. The object of a single player game is to maximize the entire 6 x 6 tile board, travel far along the paths, and create loops. Each move you are presented with three tiles of varying paths to play . The beauty and fun of the game really shine as the tiles begin to fill up the board and criss-crossing paths are formed. As your stone travels along the paths you've created, the opportunity to create a loops by crossing your traveled path present them selves. Loops are a key to prolonging your stay on the board and taking full advantage of all your tiles. In a loop count game, of course, the most loops wins. Tsuro by Calliope Games is adapted to our screens by Thunderbox Entertainment and ports over very well from the board game. The game mechanics are easy to understand and implement. You'll simply "Tap your tiles to get the path you want, then drag the best one in front of your stone," - Tsuro Tutorial. Your stone will follow the path laid out in front of it, so plan ahead, choose wisely, and make sure to stay on the board! Tsuro provides us with an easy and well paced tutorial through the game taught by Calliope herself. After only a few brief minutes, I felt my stone was ready to traverse the board with confidence. For me the only hurdle, and a small one at that, is accurately predicting the path tile I'm about to play. By this, I mean sometimes the board is busy with tiles and if one is not careful, you may mistake the path on the tile you choose and end up off the board or soon to be. Most of the time a notification from Calliope will prohibit you from placing a tile which moves your stone off the board if there is a different tile in your hand that could be played. Thank goodness, because like an idiot sometime I play quickly and seem to just throw tiles out all willie-nillie like. What the Tsuro tutorial does not offer is tips to starting a multiplayer game. Or even how to add other A.I. opponents in a single player match. While experienced gamers may find the icons helpful, newly digital board game players will have to navigate blindly through the multiplayer options. Tsuro feels like a slow walk through a meditation garden with a cup of green tea and a butterfly on your shoulder. I absolutely love the watching my stone piece move along the paths, leaving its trail behind. The pace of play is just right, as even with multiple A.I. players the game flows effortlessly from one player to the next. A couple of graphics and game speed options are available within the settings menu. I prefer keeping the Turbo option off and the Snazzy Visuals on. The musical score and action sounds in Tsuro are magical and mesmerizing. As your stone carves its way along the board, you hear the etching of the stone into the playing surface and it's quite nice. In the background ancient string instruments gently play. I feel like this game was played thousands of years ago in mountaintop monk monasteries. 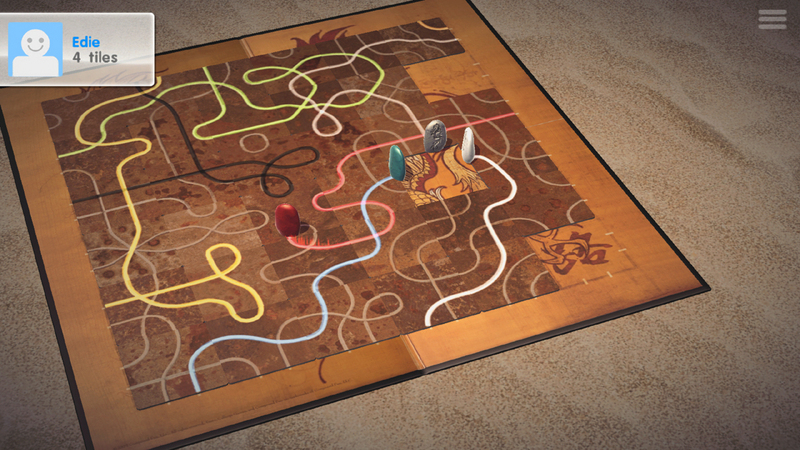 The look and feel of Tsuro truly captures it's whimsy and simplicity. Tsuro offers a local pass and play option, and cross platform asynchronous online multiplayer options. Again, these are not made clear by any means. If you want a pass-and-play game then move your stone to a starting point along the edge of the game board, then choose another stone and do the same. Should you choose - there's the ability to play an up to 8 player local game. Online play is here and I've frequently been able to find opponents to match with. The problem lies in the speed and continuity of the online games. I've yet to complete an asynchronous online game due to the lack of notifications and slow pace of back and forth play. Also available is the ability to "Find nearby players" and start matches with a buddy across the table/couch using your own phones. This feature actually works very well and I recommend using it over the pas and play option. Tsuro, in my opinion is best played in Single Player mode. As mentioned before in this Tsuro app review, the game is about creating your own path, and single player mode is a great way to challenge your self. What I really enjoy in single player mode is attempting to best my previous tile count, distance traveled, or loops created. The loops mode is quite possibly the most fun of the three game variations. The sound of a "knock" is heard each time you create a loop, and while it is a brief and small part of the game, the sound is lovely. While creating as many loops as possible, you must also remember to stay on the board. I would like to see a combined score of loops, distance and tiles played for a cumulative account of single game achievements. Single player mode vs. any number of AI opponents is also fun and very challenging. Should you choose to play against all 7 AI opponents, get ready for a Battle Royale of ancient proportions! I recommend turning Turbo "on" in this large of a game, as your opponents turns will be lengthy otherwise. We would certainly like to see Tsuro of the Seas and the expansion ported to our mobile devices in the very near future. Navigating through Tsuro the first time without the tutorial nor hints enabled may be a little frustrating due to unmarked or labeled icons and unclear game directives. Do not let this deter you from continuing along the path to becoming a Tsuro master. Given that Thunderbox Entertainment only has a couple of board game app adaptations available, I would like to see the company port other games over in the near future; starting with all available Tsuro expansions and additions. We hope you enjoyed our Tsuro App Review today. I've been playing this game weekly for months now, but I'm not sure how much longer I can continue without any updates. Regardless, I enjoy the ever changing board as tiles are placed and the serene mood I'm in while playing. This little gem will make you think twice before laying down a tile. You'll need to take into account every available tile rotation before making your final move. - The nice stone-on-board sounds throughout the game play. - Little to no barrier to entry, yet difficult to win every time. - The ability to alter graphics quality & speed of movements. - Online Multiplayer functions are lacking all around.